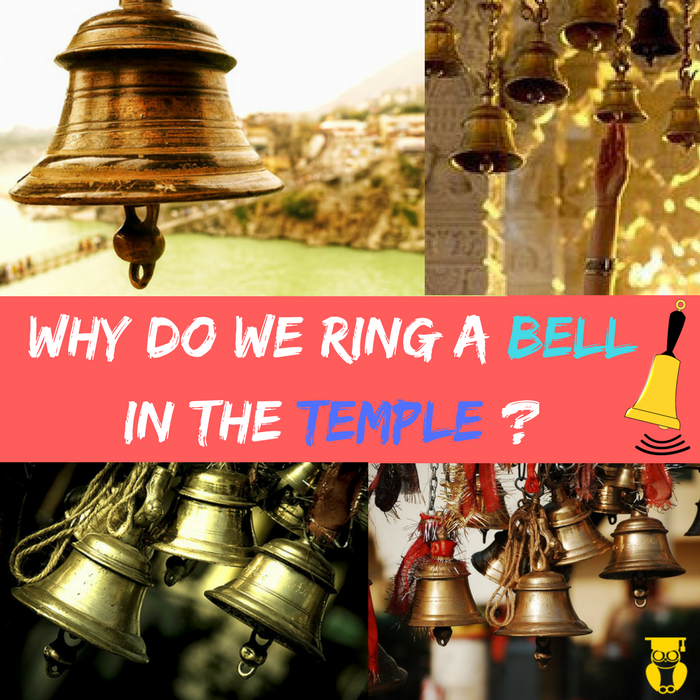 Why is a Temple Bell rung before entering a temple ? Home Science Vs Vedas Why do we ring a Bell in the Temple? In Kaliyuga, our minds are so occupied that the only way to awaken ourselves is “with a shock”. A temple Bell works as an anti-dote all the confusions and misconceptions in our mind. What is a temple bell? One which can be hung on a hook. This type of bell can be seen in temples. The other one is a small hand held bell which can be rung by our palms. This type of bell is normally used in homes. “uthsatanam pisasatheh preenanam sahareh paramsannithana mamarthyanam ghantaayachalanath baveth”. Ringing a bell in temples will prevent evil spirits from detaching themselves upon you. The evil spirits like Yaksha, Paisasa, Rakshasa and Brahmarakshasa will not enter the temple. This is the reason why all the Hindu temples have a bell/ghanta/gong at the entrance or inside the temple and usually the devotees need to ring it before entering the temple and while doing pooja to God. Bells are an integral part of Christian tradition as well. Bell towers can be found in old churches, across the world. Even today, some churches ring a bell before masses during the day. And we all know about Santa Claus’s bell, right? Is it to wake up the Lord? Obviously Not. The Lord almighty never sleeps. Is it to inform the god almighty that we have come? Obviously Not. He does not need to be told or informed about our whereabouts. He has the supreme knowledge and knows everything. Is it a permission that Hndus or Indians seek before entering His precinct,the temple? Obviously Not. A Temple entry needs no permission. The Lord welcomes us everywhere and anywhere at all times. Why do Hindus ring the bell? The bell is generally made of brass. A clapper is attached to the inside and the bell makes a high pitched sound when rung. The top of the bell handle is usually adorned with a brass figure. While those used in the worship of Lord Vishnu or his avatars like Rama, Narasimha or Krishna will have a figure of Garuda, Panchajanya shanka or Sudarshana Chakra. The bell with an eagle is said to remove sorrows arising due to snakes, fire and lightning. It is believed that this bell is much dearer to Lord Vishnu. It is an age old tradition to ring the bell of the temple upon entering its premises. Bell ringing is an ancient Vedic ritual. One can see multiple bells hanging over the domes in many ancient Indian shrines. In almost all Hindu temples there are one or more bells hung from the roof near the entrance to the garbha griha. Hindus go to a temple to have “Darshan” (vision) of the Lord first before praying. The purpose of Darshan is to establish a communication between ones own “Aatman” (the divinity within you) and the “Paramaatman” (the Supreme Divinity). Darshan of the Lord is an essential and primary part of the Hindu faith. The ringing of a bell produces an auspicious sound. It produces the sound Om, the universal sound of Lord almighty. Bells are thus used so as to maintain an auspiciousness within and without a temple, and to attain the vision of God Almighty who is the ultimate supreme. The ringing of the bell drowns any irrelevant or inauspicious sound, and pervades the whole atmosphere. This reminds us of, the all pervasive nature of the supreme god(Sarva-vyaapi). I ring this bell indicating the invocation of divinity, So that virtuous and noble forces enter (my home and heart), and the demonic and evil forces from within and without, depart from my home and heart. Bells have a symbolic meaning as well. The curved body of the bell represents Ananta. The clapper or tongue of the bell represents Saraswati, the goddess of wisdom and knowledge. The handle of the bell represents Prana Shakti – vital power and is symbolically linked to Hanuman, Garuda, Nandi (bull) or Sudarshana Chakra. In physical sense, the ringing of a bell, engages all senses of our body and stimulates the inner ear within us. The moment bells start ringing,our mind gets disengaged from all thoughts and becomes more receptive towards god and his devotion. Lord Krishna saved the inhabitants of Gokul from the anger of Indra, during Govardhana puja, by lifting the Govardhana Mountain. After this incident, the bell which was tied to the neck of Iravata, elephant of Indra, was gifted by Him to Krishna. This is considered as the beginning of the use of a bell in deity worship. As discussed above, Bell is not made up of your ordinary metal. It is made of a composition of metals including brass, cadmium, lead, copper, zinc, nickel, chromium and manganese. The proportion at which each one of them mixed is the real science behind a bell. Each of these bells is made to produce a distinct sound which unites the left hemisphere and the right hemisphere of your brain. The moment you ring a bell, a sharp but lasting sound is produced which lasts for at least seven seconds, in echo mode, good enough to touch the seven healing centers or chakras in your body. (if you find a bell whose sound doesn’t echo for 7 seconds.. then it is not made correctly) The sound of a bell empties your brain from all thoughts and sufferings. Invariably you enter a Tran’s state where in you are much more receptive and much more active. This Trans state is full of awareness. This helps us in entering a very sharp state where we can achieve a very good level of concentration and focus. According to the Skandpuran, the ringing of temple bells absolves man from sins that he has committed in his previous births as well. Let us now see how the energy is emitted from the bell and what exactly happens with the help of a subtle drawing . The dome shaped body of a temple bell and the clapper when strike with each other create circles of chaitanya which are projected in the atmosphere. The sound generated simultaneously emits frequencies of chaitanya predominant in Akash tattva (absolute ether element).The figure depicts them in yellow color. The stroke of the clapper emits red colored divine energy rays in the environment and the surroundings. The particles of divine energy which spread in the atmosphere,depicted in red color are also seen here. The divine energy and chaitanya generated by the sound of bell drives away the negative energies from the atmosphere. To drive away negative forces inside you or around you and to attract the positive forces towards you. One of the major reasons that you should visit a temple is that it charges you with spiritual and positive energy. The design of a temple is made in such a way that it gets filled with maximum positive energy possible. Most popular temples are made on places where the earth’s magnetic lines are meeting or some divine religious event had happened. Many thoughts occupy your mind at all times. It is difficult for you to stop the thinking at will. You take your office problems to your home and then in night to your bedroom. There has to be a mechanism to stop these worldly thoughts from entering inside the temple, so that you can remember and worship god with peace, devotion and totality. A temple bell takes care of this. Ringing of a temple bell creates a no-mind state (no thoughts) inside you. Suddenly there is your mind goes blank for a few moments. it gives you an opportunity to focus your attention on god and devotion. This is the reason why bells are placed at the entrance of a temple and also before a temple sanctum, so that you can leave your worldly mind outside and only think about god while in the temple. Ideally while ringing a temple bell you should remember the deity intensely, so that the vacuum (no-mind state) created by a bell is filled with thoughts of the deity. This is the reason why most hindus take the name of god (like jai sri ram or har har mahadev) while ringing a bell. In Āgama, it is mentioned that a temple bell should be made of pancha lauha (five metals) that are copper, silver, gold, brass (main metal in the bells) and iron. These 5 metals represent the Pancha Bhoota. The composition of these metals in the bell varies from bell to bell, which alters the sound. Another belief is that this composition of metals in a temple bell helps to kill the bacteria or germs in and around the temple and also purifies your aura.